A new TA Instruments DHR3 single head rotational rheometer will be installed in the Bard Materials Facility in January 2014. This diverse system has the ability to measure rotational and frequency based viscosities, yield stress, cure Kinetics and recovery properties against a wide range of temperatures and shear rates. 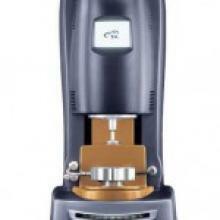 It also has the ability to measure storage and loss modulus of viscoelastic materials in shear. Large Angle Oscillatory Strain data can be extracted. Multiple geometries are available ranging from concentric cylinders to parallel plate, and cone and plate. Sample volumes required for cone and plate geometries are very small ~100µL Concentric cylinders are much larger requiring ~ 50mL. temperature ranges from 0°C to 600°C.